Or If you are interested in becoming one of our professional licensed guides, please give Tim Gatewood call at (928) 369-5087. Recreation Fishing Permits are required for all person(s) 10 years of age and older taking aquatic wildlife on the Fort Apache Indian Reservation. Children under the age of 10 do not require a permit, but need to be accompanied by an adult holding a valid permit. For the dedicated fishermen and the up-and-coming ones, we offer yearly permits (annual). These permits are good for the calendar year (Jan. 1, 2016 through Dec. 31, 2016). Recreation Fishing Permits are limited to the taking of GAME FISH ONLY. 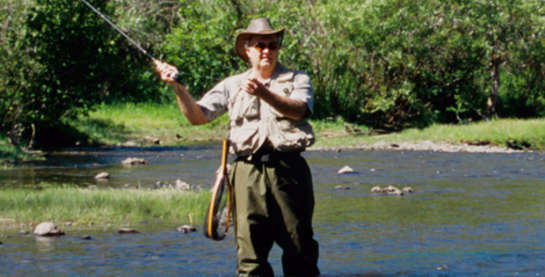 Game fish include all species of Trout: Apache Trout, Brook Trout, Brown Trout and Rainbow Trout. Other species include Large and Small Mouth Bass, Northern Pike, Channel Catfish, Bullhead Catfish, Flathead Catfish, Sunfish and Carp. Fishing Permit does not allow the taking of amphibians, mollusks or crustaeons: except Waterdogs and Crayfish/Craw dads. One pole, one line not having more than (2) hooks or (2) artificial flies or (2) lures. Fishing with multiple poles, leaving poles unattended, set line or trotline are not allowed. Artificial lures and flies do not include living or dead organisms, natural or prepared food stuff, artificial salmon eggs, corn, marshmallows or any type of powerbait. Aquatic Wildlife may be taken day or night and artificial lights may be used. This does not include lakes and streams classified under "Special Fishing Regulations". Using or possessing live baitfish or placing and spreading any type of bait in waters (chumming) are all illegal acts on the Reservation. Waterdogs and Crayfish/Craw Dads maybe taken by angling, hand, net or using a lawful minor trap. Waterdogs may only be used as bait to fish stock tanks on the Bonito Prairie and the Black and Salt Rivers. We offer a waterdog permit! Please be aware that digging for worms, cleaning of fish in waters/stream and fishing from boat docks are all illegal acts on the Reservation. Ice fishing holes may not exceed 8 inches in diameter. Remember any fish put on a stringer or in a creel basket is considered yours and cannot be released back into the water. Yes, the Reservation has a bag/possession limit, please for everyone's enjoys and for future generations, abide by this law. See Bag/Possession Limit Section. Season on all species listed are year-round unless otherwise noted by WMAT Game & Fish Department. All Trout species: Apache Trout, Brook Trout, Brown Trout, Rainbow Trout. The daily bag limit is five (5) for adult (ages 15 and over), three (3) for juveniles (ages 10-14) and two (2) for sub-juvenile (9 and under). Other species of fish are as follows: for Large Mouth Bass, Small Mouth Bass, Channel Catfish. The daily bag limit is fifteen (15) for adult (ages 15 and over), eight (8) for juveniles (ages 10-14) and eight (8) for sub-juvenile (9 and under). Sunfish, Northern Pike, Flathead Catfish, Bullhead Catfish, Waterdog, Crayfish/Craw dads have no daily limit for all ages. These regulations are used to manage a specific lake or stream in a way to improve quality and protect unique fisheries on the Fort Apache Indian Reservation. The following area fall under the "Special Fishing Regulations". Reminder all trout must be release immediately. LOAFER, BOGGY, LITTLE BONITO, SQUAW AND FLASH CREEKS (stream fishing) - These areas listed are all catch-and-release and artificial flies and lures ONLY with single hook. No Treble Hooks. The stream contains naturally reproducing Apache Trout. NORTH FORK at DITCH CAMP (stream fishing) - Open areas are located east of Horseshoe Lake and includes the area east and upstream from R78 road crossing on the North Fork to the confluence of Snake and Becker Creek. This area is CLOSED to vehicle traffic of any kind, again please observe all road closure signs. This is also, a catch-and-release area and artificial flies and lures ONLY with single hooks. No Treble Hooks. PACHETA LAKE (lake fishing) - Artificial flies and lures ONLY with one hook. No Treble Hooks. Catch and Release ONLY. CHRISTMAS TREE LAKE - Artificial flies and lures ONLY with one hook. No Treble Hooks. For more information and reservations see our Christmas Tree Lake Program. CYCLONE LAKE - For more information and reservations see our Rent-A-Lake Program. HURRICANE LAKE - For more information and reservations see our Rent-A-Lake Program. TONTO LAKE - The lake is CLOSED to all non-tribal members.